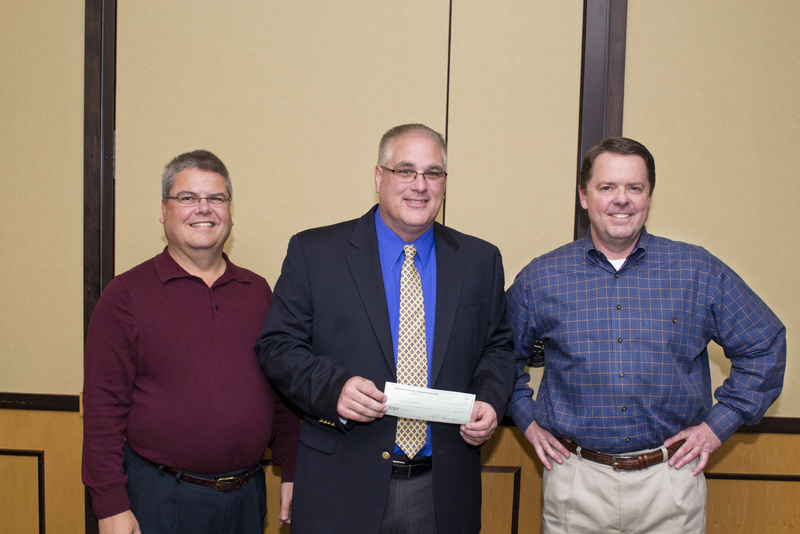 Merchants Bonding Company President, Larry Taylor, and Secretary, Bill Warner, Jr., presented Executive Director of Youth Homes of Mid-America (YHMA) a check for $105,000 on October 30. YHMA, a private, non-profit, children's and family social service agency that provides aidto troubled youth and their families by offering housing, classes and support through many programs, was the beneficiary of the Bill Warner Sr. Memorial Charity Golf Classic. Arndt said that YHMA was grateful for the donation, and that the funds would go a long way in making a big difference in the lives of families. Arndt, along with Bob "Mack" MacKenzie, Director of Development; Brad Mellencamp, CFO; Chris Koepplin, Treatment Director; Mike Pavon, Director of Program Services; and Wendy Ingham, Annnual Fund Coordinator, presented Taylor, Warner, and Merchants Bonding with an engraved plate to express their gratitude.